I've been meaning to get this up for a while now: a simple link to a series of articles at X-Entertainment on bygone soft drinks — those that were widely distributed and then yanked due to customer revulsion as well as those that never made it past test markets. Crystal Pepsi, Coke II, Strawberry Burst Pepsi, Surge, Pepsi Blue, Pepsi Fire and, of course, Orbitz. What a freakish, partially digested, suspended animation abortion of a beverage. I actually think I have some Orbitz somewhere in my closet at home. Clearly, I realized how short-lived the product would be and thought to hold onto a couple for kitsch value. And is it odd to anyone else how the online travel company just kind of swooped in and stole that brand name? Am I the only one who thinks about gelatinous balls suspended in sugar water when I see their ads on TV? The same guy who wrote the dead sodas article has also written separate entries on rarities like Pepsi Holiday Spice, Mountain Dew Pitch Black, and the Jones Soda Holiday Pack. I was surprised to learn that in addition to the infamous Turkey and Gravy flavor, the pack also includes Cranberry Sauce, Mashed Potatoes, Fruitcake, and Green Been Casserole. Somehow, these little bits have slipped past my pop culture awareness. Little, Orbitz-like bitz. 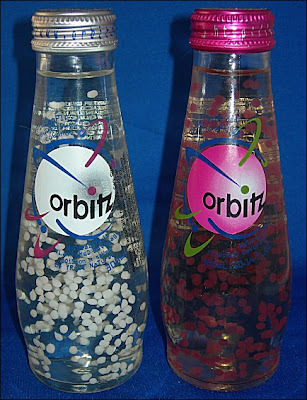 You know, I actually have two bottles of Orbitz at home somewhere, gathering dust and potentially increasing in value.